The Finest Salt Nic - Mango Berry 30mLMango Berry is a sweet and succulent nicotine salt that w.. 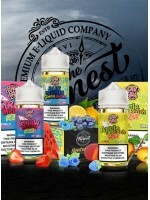 The Finest Salt Nic - Berry Blast 30mLThe flavor profile is filled with an assorted mix of fresh swe.. The Finest Salt Nic - Apple Pearadise 30mLThe flavor of this premium e liquid tastes like fresh, swe.. The Finest Salt Nic - Blue Berries Lemon Swirl 30mL Blueberry and blue raspberry on the inhale .. The Finest Salt Nic - Apple Peach Sour Rings 30mLSweet and sour green apple and peaches to.. The Finest Salt Nic - Straw Melon Sour Belts 30mLThe Salt Nic Straw Melon Sour Belt series is a perf..